12 April 2019 : Today Yamaha India Motors Pvt. Ltd launched its 3 motorcycle series in Lucknow, The ‘R series’, the ‘FZ series’ and the new ‘MT series’ and offered Free test drive. 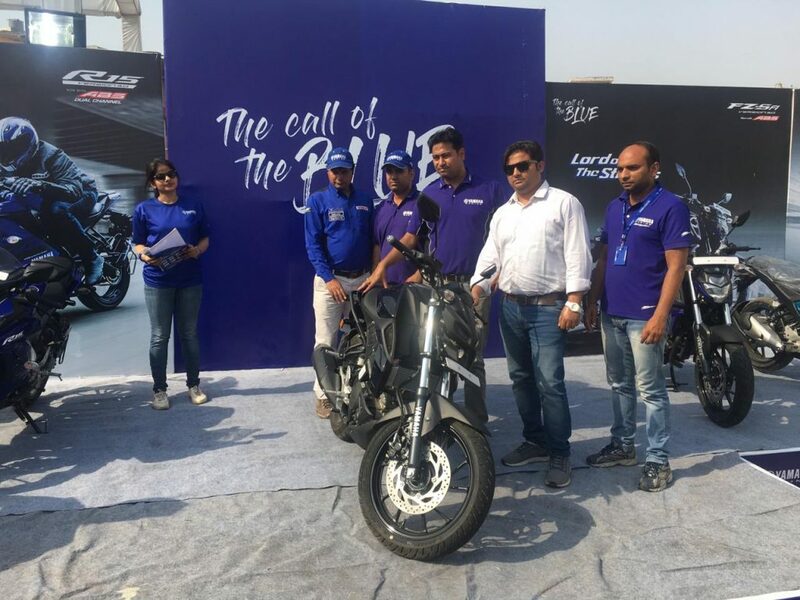 In this order Yamaha began its three days Campaign ‘Call of the blue fiesta’ Mr. Saurabh Sinha, Regional head of U.P, Yamaha Motor India group of companies inaugurated this Fiesta campaign. On this occasion Mr. Saurabh Sinha, said, “Today’s customers look for variety and diverse range of products. We at Yamaha will always try to introduce new biking experiences to our customers and excite them with products and services that exceed customer expectations. Furthermore, he told about the MT-15, “the entry of MT-15 is inevitable with the new trends of motorcycling in India which will further multiply brand’s excitement as it would entice customers in exciting, stylish and sporty motorcycling with its unique torque and agility along with design excellence and engineering. Where in the riders want diverse experiences with speed and controls. The new MT-15 (155 cc) mounts a liquid-cooled, 4-stroke, SOHC, 4-valve, 6-speed transmission, 155cc fuel-injected engine along with Variable Valve Actuation (VVA)system on a Delta box frame. The new MT-15 triggers agile and strong-feeling acceleration and flaunts outstanding traits of the styling with enhanced control postures along with A&S clutch and single-channel ABS. In this three days campaign Yamaha is offering many exciting Sales and service offers for customers like, The women will be given free scooter driving training, and the children will be taught about various traffic rules and safety measures, while art and dance competition for children. The program brings good news for the people as free service check-up of two-wheelers and washing. Moreover you can get a new bike in exchange of the old one. Yamaha is also offering Rs 7000 cash back on Fazer 250 model, Rs 3000 free accessories on purchase, free vouchers worth Rs 75,000, free helmet, free full tank petrol and many more exciting gifts. This program will take place from 12th to 14th of April at Four Lawns, from Friday to Sunday between 10 AM to 8 PM.